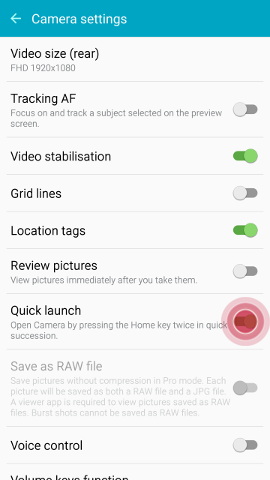 How do I quickly launch the Camera application on my Galaxy S6 edge+? You can quickly launch the Camera application on your device by quickly pressing the Home key twice or by using the lock screen shortcut. When the Quick launch feature is turned on, quickly press the Home key twice to launch the Camera application. The feature works from any screen, including the lock screen, even if you have set a secure lock. 4. Touch the slider next to Quick launch to turn it on .